For many people, looking good and feeling good are important and desired goals. People want firmer tighter body contours, reduced cellulite, younger, smoother, lifted skin, fewer lines and wrinkles. WHAT AREAS OF THE BODY CAN 3DEEP TREAT? 3DEEP® can tighten sagging or loose skin wherever it exists on the body. The treatment is commonly used to reduce wrinkles and firm areas of the face and neck. Other areas include chest, upper arms, abdomen, thighs and buttocks. WHY DO WE EXPERIENCE SAGGING AND DIMPLED SKIN? Our skin is supported by a network of collagen and elastin fibers in the middle layer of the skin, beneath the epidermis (dermis). Collagen provides structural support and gives the dermis its resistance to strain and traction, while elastin gives skin its elasticity. As we age, skin loses some of its firmness and elasticity. After age 35, our skin gradually loses its firm, youthful look as our body’s natural levels of collagen and elastin begin to slowly decline. Environmental factors such as urban pollution, photodamage caused by long-term sun exposure, hereditary and lifestyle factors including, smoking, alcohol consumption, poor nutrition and stress can hasten collagen and elastin’s decline and contribute to these fibers becoming less structured and less elastic. This results in thinning of the skin, fine lines and wrinkles and sagging of the skin, also known as skin laxity. In some areas of the body, more noticeably the buttocks and thighs, the skin appears to have areas of fat deposits causing an orange-peel dimpled appearance of the skin, commonly referred to as cellulite. Although the predisposition to cellulite is thought to be genetically inherited and hormone related, it has been touted to be related to impaired supporting collagen fibers, impaired lymphatic drainage, poor blood circulation, fluid retention among other factors. 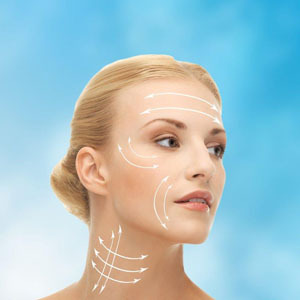 The good news is that it is possible to reduce some of these signs of aging with noninvasive methods. There is now a novel multi-source, phase-controlled, radiofrequency technology that is safe, effective and targets the face, skin and body called 3DEEP® technology. Our experience has shown that when using the 3DEEP®, it is possible to tighten loose skin and promote production of healthier, new collagen. 3DEEP® addresses Facial Tightening, Body Tightening, Body Contouring and Fractional Skin Resurfacing (FSR). 3DEEP® controls the power and the depth of the rafiofrequency (RF) energy delivered to the skin, uniquely different to the other RF products on the market today. The genius of 3DEEP® rests in its use of multiple RF sources and a sophisticated software to effectively control the phase of the energy flowing between the handpiece electrodes. This significantly reduces the energy flowing along the skin’s surface, as well as any side effects. It eliminates any need for cooling of the skin in order to protect the skin. The Phase Controlled Technology (PCT) features revolutionary technology that provides Dr ChinQuee and her team full control to direct the RF energy exactly where it is needed for maximum results. If an appropriate amount of energy is delivered, the collagen will contract, providing an immediate change in the skin’s appearance. This energy treatment method has a second effect as it enables the delivery of controlled heat deeper into the skin to stimulate new collagen production thus tightening the skin, without harming the overlying outer layer of the skin (epidermis). This combined action is clinically proven to deliver tighter, firmer, lifted ,younger looking skin, safely and effectively with little to no downtime and is suitable for all skin colors, even tanned skin. The 3DEEP technology is efficient for most body areas. Different body areas require different energy parameters. In order to achieve optimal customization of the treatment for you, Dr. ChinQuee will determine the treatment parameters that will be most effective for you. During the procedure, the deep skin layers are heated gradually, while the skin surface is maintained around 40° C (hot shower temperature). The treatment is comfortable, relaxing, free of pain, carries no side effects and feels like a warm massage. Your skin temperature is monitored constantly throughout the procedure. Dr. ChinQuee recommends 6 treatments spaced every 1 week for optimal results and a single treatment every 6 months for maintenance of the results. You should start to see improvement in your skin following the second treatment and additional improvement will gradually appear as the treatment course progresses.Depending on the size of the treatment area, treatment may take between 30-45 minutes. You may experience a feeling of heat during the procedure. Slight redness may be noticeable around the treatment area, which usually disappears in a few hours. As healthier new collagen is formed, tighter, more natural looking and firmer skin will be produced. Overall body contour is enhanced, circumferential reduction is noted and the appearance of cellulite is improved. The gradual improvement in your skin will continue even after completion of the treatment series. 3DEEP may also be safely used in combination with other non-invasive devices if your area(s)of concern and severity of condition dictates that this would optimize your outcome. Although the improvement in skin quality should be long lasting, the natural aging process continues; thus the recommendation for maintenance treatments to help maintain the achieved results. However, maintaining the results of, for example, body contouring or body tightening treatments, is also subject to a person’s calorie intake, exercise and lifestyle. So, a balanced diet, proper exercise program, adequate restorative sleep, proper management of stress and healthy lifestyle ,will help to maintain the desired treatment effects.